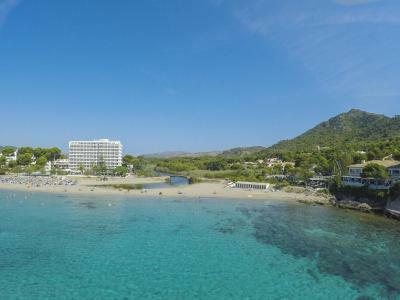 Lock in a great price for Universal Hotel Castell Royal – rated 8.5 by recent guests! Close to the beautiful beach. Spacious rooms. Nice staff. Friendly staff, but only some people talk English. Very clean rooms and whole hotel. Great place with beautiful beach. Very good breakfast and dinner. Rooms facing to the mountains have very large balcony with part sea view. Everything. 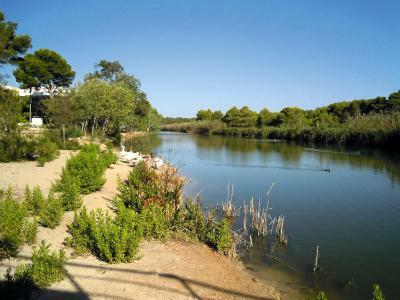 Great location, wonderful breakfasts and dinners. Beautiful beach view from all rooms. Right next to the beach. Quiet (except when the beach bar next door decides to celebrate a wedding with loud music). The entertainment in the evenings at the pool terrace was very nice. Location, cleanliness, excellent restaurant & friendly staff. The buffet breakfast and dinner were excellent with plenty of choice. Rooms were spotless as were cleaned daily. All rooms have a sea view. Gate leads directly from pool onto beach. Clean room, comfy bed, really nice room with beautiful sea view and beach. Nice staff, very helpful on every question. Safe, calm region. Good breakfast. Das Abendessen war sehr gut und das Personal besonders freundlich. Universal Hotel Castell Royal This rating is a reflection of how the property compares to the industry standard when it comes to price, facilities and services available. It's based on a self-evaluation by the property. Use this rating to help choose your stay! 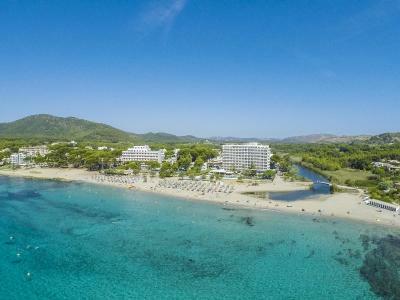 Set on Canyamel’s seafront, Universal Hotel Castell Royal is right next to a sandy beach. 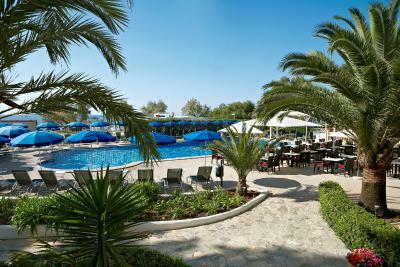 It features an outdoor swimming pool, a buffet restaurant and a lounge bar with a TV. 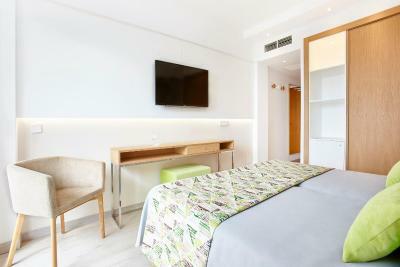 Each bright, air-conditioned room at Universal Hotel Castell Royal is decorated in blue and pale yellow tones. All rooms have a flat-screen TV, a fridge and a private bathroom with a hairdryer. Most rooms offer sea views and connecting rooms are available. 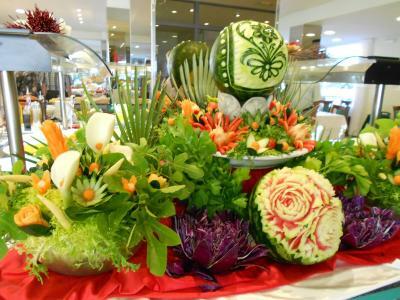 The buffet restaurant serves themed dinners twice a week and there is also a gala dinner on Fridays. Bars and restaurants can be found in the area surrounding the hotel. 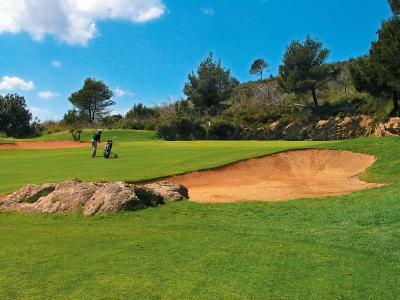 The Universal Castell Royal is within 10 minutes’ drive of 4 golf courses. 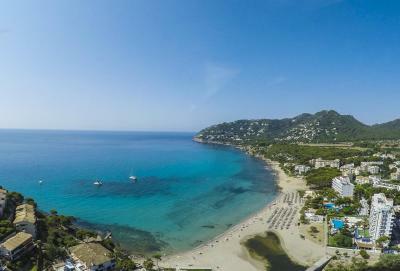 Cala Ratjada is 6.2 mi away, while Manacor can be reached in 30 minutes by car. Palma and the airport are within 50 mi of the hotel. 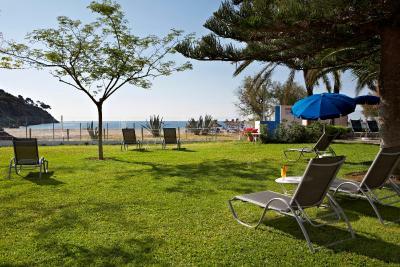 When would you like to stay at Universal Hotel Castell Royal? This bright, air-conditioned room is decorated in blue and pale yellow tones. It has a flat-screen TV, a fridge and a private bathroom with a hairdryer. Most rooms offer sea views and connecting rooms are available. This twin room features a balcony, private entrance and air conditioning. This twin room has a balcony, tile/marble floor and sea view. 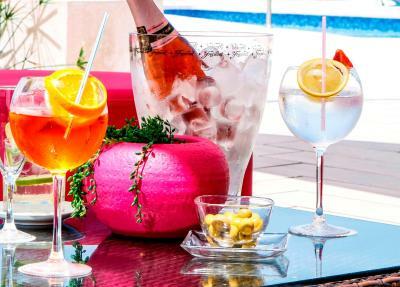 House Rules Universal Hotel Castell Royal takes special requests – add in the next step! Universal Hotel Castell Royal accepts these cards and reserves the right to temporarily hold an amount prior to arrival. Please inform Universal Hotel Castell Royal of your expected arrival time in advance. You can use the Special Requests box when booking, or contact the property directly using the contact details in your confirmation. You only get great sea views if you are on the 3rd floor or higher, so consider upgrading (I asked for a higher floor a month before arrival but was given the room at the lowest floor). Food is very average, I was disappointed. You have to pay for EVERYTHING- safe, beach towels, use of sun loungers on the hotel territory. We had to wait a long time for lifts - only two lifts for such a big hotel are too low. The restaurant at the beach the waiters were unfriendly and the food was not so good as in the hotel. The pool, beach and drinks at the hotel bar. Food is pretty bad. Definitely not 4-stars standard. The mattresses are not comfortable (too worn out). And you have to pay everything extra: the safe in the room, the sun beds in the pool, high speed Internet... it feels like a rip off. 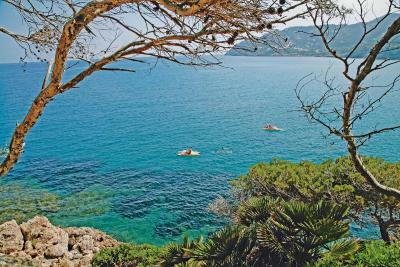 Excellent views - beach, nature near by. The place appears to be from the 80ies and not being refurbished since the. Sub standard compared to modern 4star hotels. Room standard very basic. A/C very old and hardly working. Food ok.
Seafront location with nice sea view. All inclusive should mean all inclusive Not selective drinks only Snack bar not convenient location Supposed to be cake / tea in the after, but didn't see any. Entertainment was lacking. Bingo x2, Quizx2 in German. Relaxing music guitar night! More English spoken. Coffee making facilities in the room.